It’s happening!!! For a few months now, I’ve been planning, building, and pulling together the finest VFX talent to create the first of many online VFX courses. It’s clear that the world doesn’t have enough real-time VFX education. We all see it, and we all feel the pain of it in various ways: students feeling lost on where to start, leaders endlessly searching for qualified and well trained candidates, and professionals craving more growth opportunities later on in our careers. My vision is to transform all of these challenges into strengths. Okay, so what is this course, exactly? I’m building an online course that will serve as the starting gate for VFX first-timers, and a powerful boost for many professional VFX artists. And I’m not building it alone! I’m working closely with a handful of artists to help create the very highest quality content possible, across the multi-faceted VFX craft. 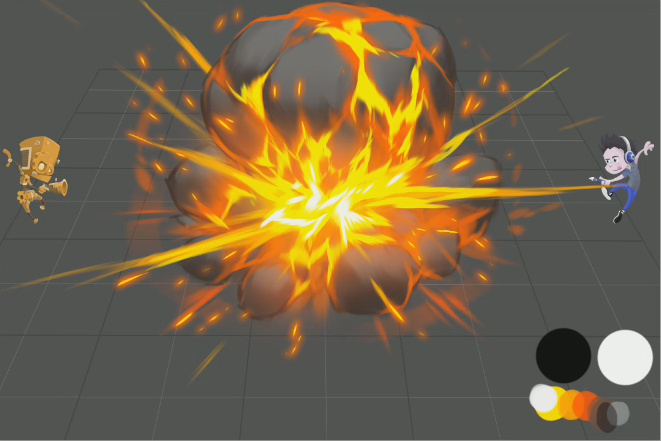 The goal is to build this learning platform out as a new arm of RealTimeVFX. More details to follow. To stay up to date on what’s coming, including the eventual launch announcement, you can submit your e-mail here, and I’ll be in touch. In the make-your-own-concept-paintings portion of the course, we’ll cover this and other beautiful elements in depth, and also provide source assets with a beginner’s guide to Photoshop to help newcomers get familiar with the various techniques David uses. More info on that to come. But to clarify, this won’t just be a concept painting course. VFX covers a broad array of topics. This course will include a handful. I’m starting with the topics I most wish I’d been taught when I was getting started in my career. These will lay a foundation for a deep, broad, and high quality VFX education, the kind that our industry desperately needs, and studios keep demanding to see in our portfolios. It’s obvious to me that I won’t be able to do this alone. Not only will I continue working with the best of the best in the industry to build the course content, but it’s critical that I continue to hear from all of you as we shape this pilot course, and the catalog of courses to follow. Thank you so much for anyone who weighed in on the survey. It’s already proven immensely valuable as I factor in what people are most hungry for, as well as the wonderful open answers you gave. Believe me when I say I poured over your responses, and have really taken them to heart. I look forward to hearing more of your feedback and ideas as this materializes in the coming months. Okay, now it’s back to work. Let’s do this thing! Wow finally it happens !! it has arrived !! I could not wait for this ! Thank you, I’m really looking forward to this course ! Just added myself to the list. I’m pretty hyped. YOu already KNOW i’m all about this! cant wait! Yesss! Amazing that you’re doing this!! Thank you to all the amazing people that are helping out!! Cant wait to apply when its out !! This is what I was really needed all this time. If you suddenly need VFX-newbies-course-testers, so then I’m ready! I am quite excited for this Jason. Thank you and your team for your time and effort to put this together. So excited to hear that! Just yesterday I was browsing online and on-campus courses for something similar, and nothing fit that well. I honestly can’t wait for it! I’ve been studying the underlines of shader programming so I can understand better the rendering pipeline and to have better foundations and I was thinking how would I transition from that to VFX and this came into my notifications. I’m humbled by all the excitement pouring in. Thanks everyone for your enthusiasm and support! I’m soooo excited for this, holy guacamole! This looks great ! I can’t wait to see more ! Already join the wait list! this is real lit!